South Adelaide junior Zac Dumesny has been selected in the Australian under-17s side to face the New Zealand Hawks this month. Dumesny has been included in the squad of 27 that features players eligible for the 2019 NAB AFL Draft. The Panthers junior is one of only seven players selected from South Australia. The squad also includes the younger brother of former Panther Adam Gulden, Errol, who is a member of the Sydney Swans Academy and the son of former South Adelaide midfield coach Ben Hollands, Elijah, who plies his trade with the Murray Bushrangers in Victoria. The players will come together under coach Luke Power in Melbourne on Wednesday, April 24 for the start of the camp, which will conclude on Saturday, April 27 when they face the New Zealand side at Marvel Stadium in the curtain-raiser to the St Kilda and Adelaide clash. South Adelaide journey down the hill to take on coastal rivals Glenelg in the annual Carey-Darley Cup at ACH Group Stadium this Saturday afternoon. The Panthers are coming off consecutive wins to start the season after defeating Port Adelaide at Alberton in Round 2, but will face tough opposition in the Bays, who made easy work of the Crows last Friday. South will make at least one change to the line up that took down the Magpies, with new recruit Kyle Emery selected to make his League debut. Emery, 22, from Palmerston (NTFL)/Noarlunga (SFL), has enjoyed two strong showings for the Panthers Reserves this season playing as a strong-marking medium forward. No omissions have been named at this stage, with big-bodied midfielder Jesse McKinnon also coming into the side on an extended interchange. The Panthers also welcome back Anthony Biemans and Coby Helyar as they make their return to the field through the Reserves. League action against Glenelg gets underway from 1:10pm, preceded by the Reserves (10:30am) and followed by the Senior Women (3:45pm). On the day South will be celebrating milestones of club stalwarts Bradley Crabb and Tyson Brown, as they notch 200 and 50 League games respectively. South Adelaide's return to ACH Group Stadium this Saturday to tackle Glenelg for the second week in a row. The Panthers enjoyed a strong win over the Tigers in Round 7 and will be looking to replicate a similar performance again this weekend. At least three changes will be made to that winning side, with Emma Gryczewski, Airlie Schirmer and debutant Brooklyn Kraft all omissions. However, South do welcome back some significant firepower with star ruck Montana McKinnon returning from AFLW Academy commitments to face her old side. Premiership defender Stacey Huddleston is also set for her first game of the season, named in a back pocket, while veteran defender Emily Woods, Grace Duffy and Elke Jarvis all find a place on an extended interchange. Women's League action gets underway at the Bay from 3:45pm Saturday afternoon, preceded by Reserves (10:30am) and League (1:10pm) matches. Entry is free to the SANFLW game from three quarter time of the League game. Approximately 3:10pm. 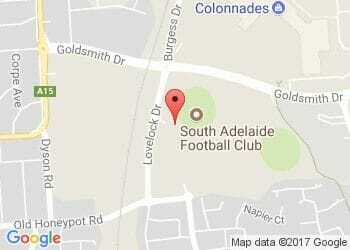 South Adelaide's junior travel to the Bay to take on Glenelg this Saturday morning. The veteran defender and former club captain from Kangaroo Island is on track to join the SANFL's '200 Club' in the Panthers Round 3 clash with Glenelg at the Bay. Reaching that milestone would make Crabby the first 200-game Panther since Trent Mills in 2004. If he plays all 18 home and away games this season it would push him into 11th all time on games played for South Adelaide, one behind champion wingman Ron Hateley's mark of 216. The newly promoted co-captain is on track for a double milestone in 2019. After playing 50 games with Port Adelaide Magpies before making the switch to Noarlunga, it is fitting that Rosey could notch his 150th SANFL game and 100th game for South Adelaide against his old side in Round 15. It is a mark that could have come earlier for the 27-year-old if not for some injury woes in recent seasons, but the skipper is fit and firing this year and ready to lead our backline with his trademark courageous play. Sam Overall (51 games) - the Panthers game-changing, but injury plagued key forward has inched towards his first South Adelaide milestone since bursting onto the scene in 2014, but notched his 50th appearance in blue and white in Round 1 this season. Tyson Brown (49 games) - a likewise luckless run with injuries has stunted Tyson Brown's progress up the games played tally since making his League debut in 2011. Now an established presence in South's backline expect him to burst past 50 games like he bursts off the halfback flank. Joseph Haines (48 games) - Joey made his debut in 2013 alongside the diminutive Caleb Daniel. After several years being in and out of the League side he now finds himself as an important part of the Panthers defence, playing all 19 games and finishing fifth in Knuckey Cup voting in 2018. Emmanuel Irra (40 club games) - always a crowd favourite thanks to his explosive dash and dare to break the lines, the E-Man has returned to the Panthers in 2018 after two years on Port Adelaide's AFL list as a Category B Rookie. Ben Heaslip (44 games) - after making his debut in the Good Friday clash with Glenelg at the Bay in 2015, Slippa has steadily entrenched himself in the League team. He played 18 of 19 games in 2019 and is now a member of the leadership group. He is in line to notch his 50th on another public holiday as the Panthers clash with Norwood on the Queen's Birthday. Tom Whittlesea (39 games) - Whitts played 12 League games in 2018 after making the switch from Woodville-West Torrens to reunite with former Reserves coach Jarrad Wright. Hayden McLean's move to Sydney opens the door to secure his spot in South's forward line and add to that tally. Abe Davis (34 games) - after an injury spoiled debut season, Davis delivered a strong sophomore campaign as he played all 19 games in 2019. An equally devastating big-bodied midfielder and goal-kicking forward, Davis finished third in Knuckey Cup voting and fifth in the Magarey Medal. He will need another clean bill of health and play the full duration of the home and away season to reach game number 50 in 2019. The years of 100 goal single seasons may be behind us, but the new 6-6-6 rule should open the ground for more scoring in 2019. Nick Liddle (88 career goals), Ben Haren (67) and Sam Overall (71) are all within reach of raising the bat in front of the sticks for their career tallies. After handing nine players their League debut last season, and with another talented crop of juniors progressing into the senior program, expect the Panthers to blood a few more new faces throughout the season. Darnell Tucker was the latest Panthers junior to progress to the League side, while ruckman Michael Knoll and former West Coast wingman Malcolm Karpany have also donned the blue and white for the first time. South Adelaide's senior women ventured to Glenelg for the first time and came away with a win on Friday evening at ACH Group Stadium. The Panthers dominated possession, finding the Burley 248 times to Glenelg's 183. Their ability to move the ball quickly (129 handballs to 64) helped cut their way through the smaller spaces of ACH Group Stadium, but they struggled to get the ball into dangerous positions inside their forward 50. As the two sides arm wrestled early on, it took until the sixth minute for the first score of the game, as goal sneak Madison Bennett found herself clear to soccer home her first into an unguarded goal square. Tall forward Danielle Goding doubled her side's advantage minutes later after finding her opponent holding the ball and converting her set shot from 25m out. However, Lucy Bellinger responded for the Bays with a calmly slotted set shot of her own in dying stages of the term and South took a six-point lead into the first change. The Panthers seized control of the game in the second term, moving it forward with greater purpose and managing to put more of a score on the board while holding Glenelg goalless. Hannah Munyard (game-high 23 touches) and Czenya Cavouras (20 possessions and 12 tackles) were the catalysts for South seizing the ascendancy as they got their hands on the footy. Vice captain Ely Haussen opened her account for the evening as she trapped her opponent holding the ball and kicked truly from 20m out. Glenelg did have a chance to get themselves back in the game as they found some momentum and locked the ball inside their forward 50 for a good five minutes, but could only yield three behinds from the time. However, the Panthers soon stamped their authority on the match. Bennett again found herself in the right place at the right time to kick one off the deck following a nice centring kick from Haussen and a courageous mark attempt going back with the flight from Mykala Walker-Murphy that brought the ball to ground. Minutes later Goding found the dangerous Munyard on a lead and her set shot gave South a 24-point advantage as the teams headed for the rooms. The third term was a dour battle, with Glenelg kicking the only goal for the term. Skipper Lauren Buchanan did well to control a backline that saw more football than in recent weeks, while first-gamer Brooklyn Kraft almost snagged a nice goal on debut to cap off a solid performance around the stoppages. Swirly conditions continued to trouble both sides in the final term and it took until the 15th minute for another goal to be scored. Bennett capped off a solid performance as she snared her third from the goal line, crumbing well again off Walker-Murphy's hands. The result holds South Adelaide firmly in second place on the ladder, just a win back from the undefeated Norwood. Round 8 action sees the Panthers return to Glenelg to again face the Tigers at ACH Group Stadium. Action gets underway from 3:45pm on Saturday, April 13th, following Reserves (10:30am) and League (1:10pm) games also against the Bays.